The thesis consists of two main divisions. The first presents an original interpretation of Martin Heidegger's philosophy. The second - premised on the first - presents a fundamental and internal critique of his philosophy. The interpretative division demonstrates the way in which the history of being is structurally grounded in the ontological conformation of Dasein. 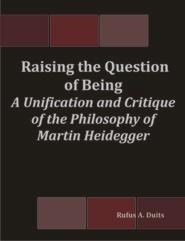 This amounts to evincing the unity of Heidegger's development of his basic philosophical project: the raising of the question of being, and requires an original account of both the philosophy of the history of being and the existential analysis of Dasein, as well as of the so-called Kehre. The critical division, which is founded upon the conclusions of the interpretative division, focuses on the structural grounding that Heidegger attempts to provide, within the existential analysis of Dasein, for his ontological demand for the overcoming of the epoch of metaphysics. This grounding is the cornerstone with which Heidegger's philosophy as a whole stands or falls. It is shown that, for internal reasons, Heidegger's grounding fails, and that the existential structures of Dasein found an essentially different ontological imperative. The most basic consequences of this failure and substitution are subsequently drawn out both for Heidegger's philosophy in particular and more generally.